In the wake of Cyclone Winston, and the devastation it has caused in Fiji, the Global Catholic Climate Movement (GCCM) has invited its worldwide community to show support for Fiji by fasting on 5 March, along with other supporters around the world. The Global Catholic Climate Movement community is saddened by the news we are receiving from some of our members on the ground in Fiji. Cyclone Winston, the most powerful storm to hit Fiji in recorded history, has devastated the small island nation. The cyclone took over 40 lives and has left tens of thousands of people homeless. The country of Fiji will join the Lenten Fast for Climate Justice on March 5th, however, with this storm and the damage it has caused, we are sure they will be fasting many more days leading up to that. We call on our members and supporters to join in solidarity with our brothers and sisters in Fiji, and fast on March 5 in addition to your given country date. GCCM are also inviting people to send a message of solidarity to the people of Fiji. You can do this through #FastWithFiji form. 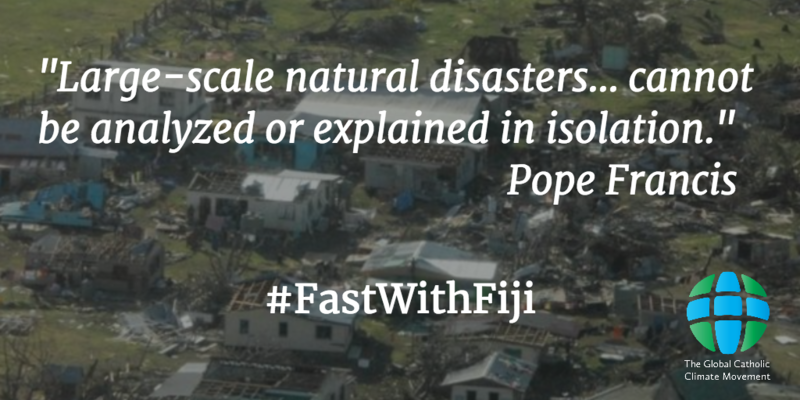 Read more about GCCM’s rsponse to the tragedy in Fiji here: #FastWithFiji.